Bantry: 2 Kms east of Bantry town on N71. The site was the present Bantry graveyard, (Árd na mBráthar) where some of the stones belonging to the friary have been gathered together. There is one carved head among these. Founded by an O’Sullivan or an O’Mahoney, Bantry friary became Observant in 1482 after twenty years of Conventual rule. The building was pulled down by Domhnall O’Sullivan Beara in 1559 to prevent the English from using it. 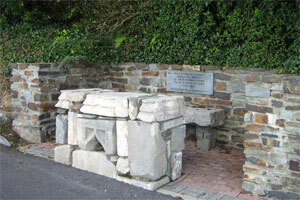 Individual friars remained in the area, especially at Cape Clear, until the middle of the eighteenth century. The abbey suffered occupations by both the Irish and English armies, and in 1720, its stones were removed to build the sables of Bantry House and the Fish Palace of Bantry Square. Today, there is a graveyard on the site. It features stone carvings and a small altar.